Here is the key behind membership engagement: Many look at engagement through the eyes of their meetings and volunteerism. The philosophy being that if you don't come to meetings or volunteer, then you aren't engaged. That couldn't be farther from the truth. Many associations struggle because past coming to meetings and volunteering, their is no "actual" value. It is "perceived" value. The biggest mistake you can make as an association is to try and sell a "perceived" value to your members. 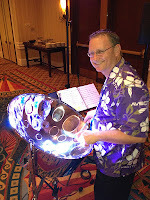 I was sitting in an association meeting I'm involved with recently where the staff liaison to the membership committee said that on their last conference call, everyone was stating, "If they don't come to our annual conference, we don't know what to tell them on why they should be a member." That's a serious problem. Keep in mind, according to the 2011 Marketing General Association Survey, only 22% of members on average attend their annual conference. This leaves 78% unengaged with the association through their meetings. Another figure to keep in mind is that the #2 reason members stated they dropped membership was a "lack of engagement" in the association. Hense, if they don't come to meetings or aren't a volunteer, your value proposition is in serious jeopardy. Knowing these two stats should send a RED FLAG up the fire pole that, as an association, you need to have some very specific programs or engagement for those non-attending members of your conference. human being or the "cause" that keeps them in the association. That is a minority in most memberships. As the numbers showed above, the vast majority of members are those who are information or transactional. When we looked down our list of benefits on the member engagement spreadsheet, we realized that we have 14-benefits that play a key role in any member's business. Having members broken out by engagement segment will give us a marketing advantage because now we can thank and reward those who are really engaged and encourage those who are not. 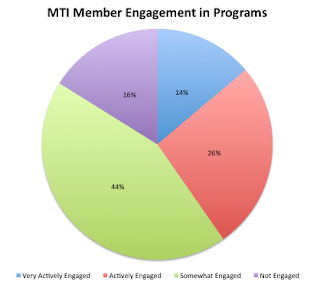 According to Marketing General's study, member engagement plays a huge role to non-attending members maintaining their membership. Have you measured, in some fashion, your member engagement? Have you separated your members into the 4-categories of engagement? Do you have a communications plan to send different messages to each? Do you know who your informational, transactional and emotional members are? Is your association's value outside of meetings and volunteering "perceived" or "actual"? Is this benefit a "perceived" value or "actual" value to the member? If it is "actual" value, state on paper the answer to, "How does the benefit have a lasting and measurable impact on a member?" If you can answer "actual" to question one and have a good answer for question two, then keep the benefit. All others, toss because they have no real value to the member. Get with your leadership in 2013 and build your membership engagement strategy. Look at the different segments of engagement, send them more targeted messaging, design benefits that have actual value and are things you do better than your members can do themselves. A highly engaged membership drives a higher level of retention. The Perfect C.P.R. for Associations To Get Their SWAGGER Back! Have you ever reached a point in your association where you feel like your organization is on the verge, or is currently drowning in the wrong strategic direction, marketing strategies, member apathy, tradition, or board politics? Do you feel like you are SO under water that you will never see the light of day again? Many associations I network with around the country are currently suffering from some, or all of the above mentioned issues. Members today don't just want programs...they want their membership to be a meaningful experience...a lifestyle where they see strength in numbers and feel a swagger by being a member of the association. Think about it...have you ever walked down a convention hall at 10:30 pm when there are three or so conferences going on at the same time? You always pass on the ones where there is nothing going on inside to speak of. ...but the one where you hear amazing music, maybe some dancing, people engaging one another in discussion...then you stop and peek in because you want to know what's going on, and most likely would love to enter and find out what's so exciting with this group. That group has CHARISMA! They saw their final night dinner as much more than just a closing dinner...it was a chance to make memories, network with others, and emotionally connect with people. of about 20 of us, and gave a toast. With conviction, he said the tag line I say at the end of every MTI TV video: "HERE'S TO NOT JUST BEING STRONG, BUT TO BEING MTI STRONG!" I have to tell you, as the CEO of this group, my heart started racing, and I wanted to get emotional because I saw for a moment that we were tapping into our member's emotions. It was awesome! So my question to you is, does your association have CHARISMA? Does your outreach to members draw emotion? Do members feel a swagger about who they belong to, so as to say..."don't mess with our company, we belong to our association!" If your association does not have CHARISMA and a swagger, I suggest you look to appoint someone to the position of "Charisma Energy Officer." This person's purpose is to figure out how to utilize all available meeting, communication, and volunteer resources, to create the same CHARISMA you see in NASCAR and WWE Wrestling. Those groups are the best at tapping into their fans passion and emotion...and it pays! Members who don't have that natural passion can be won over in time. As these members see the level of emotion growing in the association, they see great things taking place, they see transformation in the industry, and they connect the dots of that transformation to better performance within their company or profession. They can develop a PASSION for your association. To create passion, it is a MUST that you implement an active video strategy for your association. Members can't get excited and develop passion for what they can't see or hear. I hardly EVER see people getting emotional over something they are reading in a newspaper, but people watching talk shows or news stories get excited, irate, angry, happy, and down right emotional. It's because video brings people into the experience. Remember, an association without video, is like a good steak with no taste. Do what it takes to create passion in your association. Your members who don't attend your meetings need to have the same emotional connection to your association, as the members who attend meetings. "Doing things for your members they can't do themselves effectively"
"You are going to do that whether I'm a member or not"
Doing things for your members they can't do on their own is the "golden handcuffs" to keeping members forever. When a member considers non-renewing, the thought that needs to come to mind is, "We HAVE to renew or we are going to lose _________(list of key association benefits)." that members need, to gain a competitive advantage in their company or profession? If not, you need to get working on them now. Members are spending big dollars outside of associations on consultants to help them change their business models and become more efficient. That money should be going to the association, because the association is able to leverage those dollars more effectively as a group. Quit thinking small, and begin thinking large! Don't be afraid to think BIG! Ask yourself, "if we could do two things that would TRANSFORM our member companies, what would they be?" Then go DO IT! Five years from now, you will be looking back saying, "I never thought we would be able to do that...it was once just a dream, but now it's a reality, and our members love us for it." Don't drown in the water of bad strategic planning, apathetic members, and bad programs. Give your association the CPR it needs TODAY! Hit them with some CHARISMA, PASSION and RELEVANCE! It will change their life!